Space Park is a short, simple, beautiful game that backs up its easy-to-grasp gameplay with gorgeous presentation. Calling all starbound sightseers – Space Park is the new word in interstellar travel. In the spirit of adventure, you and your fellow players will zip around the galaxy to gather up exotic crystals and turn them in for badges proving your mettle as an explorer, all the while racing your rivals to 20 points and victory! Jess: And oh man, is the galaxy ever a sight worth seeing! 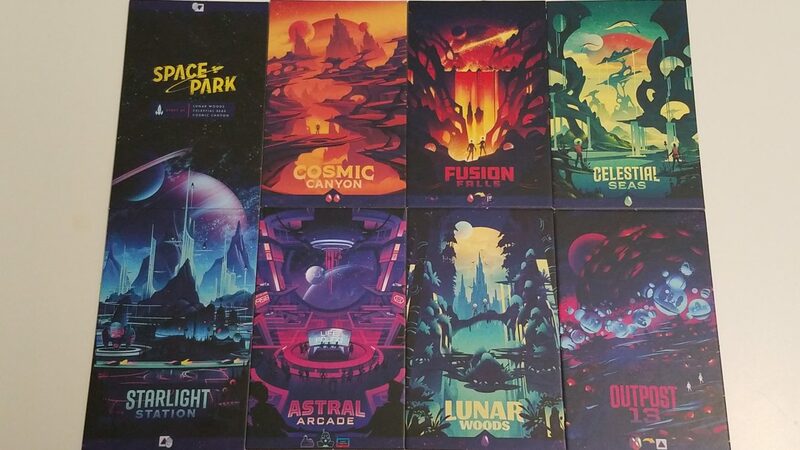 The art in Space Park, from Brian Edward Miller, is some of the most awesome we’ve got in our collection! 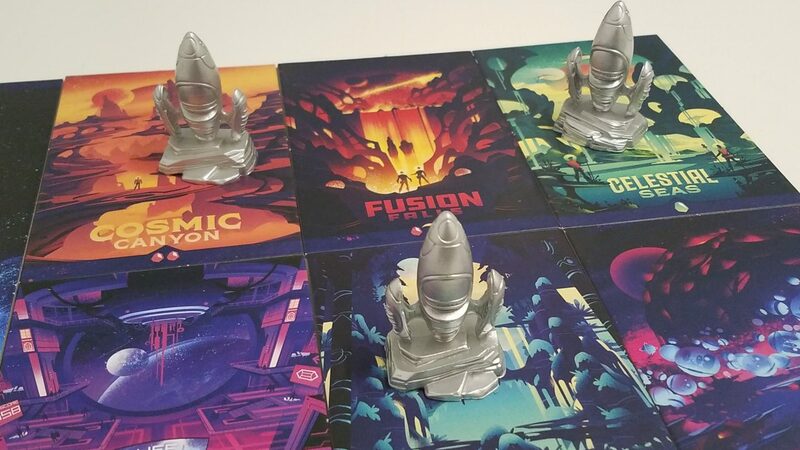 Space Park is, at its core, a fairly simple set collection game. 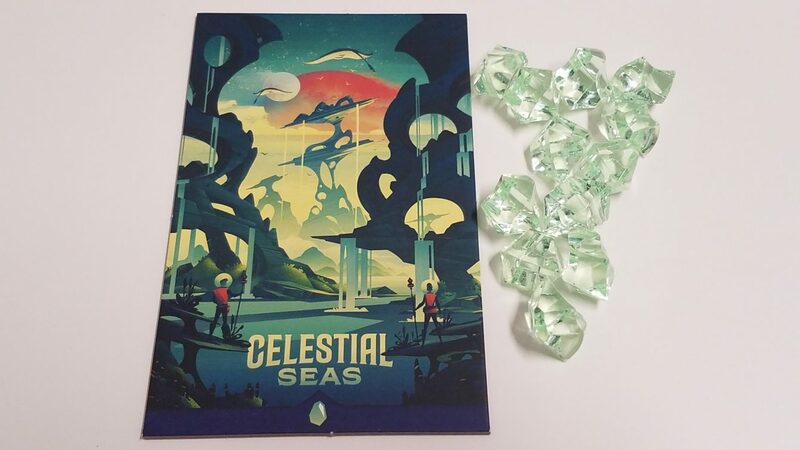 The game is a point race, and the primary way you’ll be earning those Exploration Points is by gathering up sets of crystals from the various board locations and then exchanging them for badges. 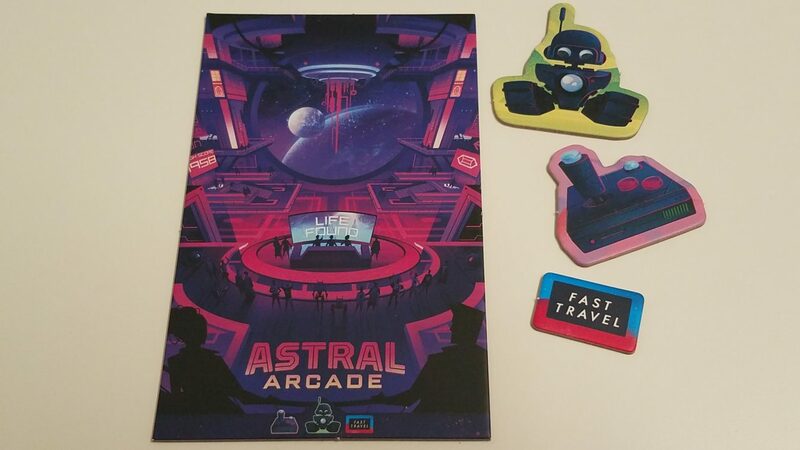 Jess: That last spot, Astral Arcade, is the only slightly-complicated one. Simply, Fast Travel passes let you move rockets before you take your action. Separately, whoever’s holding the controller gets either a Fast Travel token or a Sun crystal every time any player visits the location where Scout the robot is hanging out. Badges represent the main opportunity to gather XP. 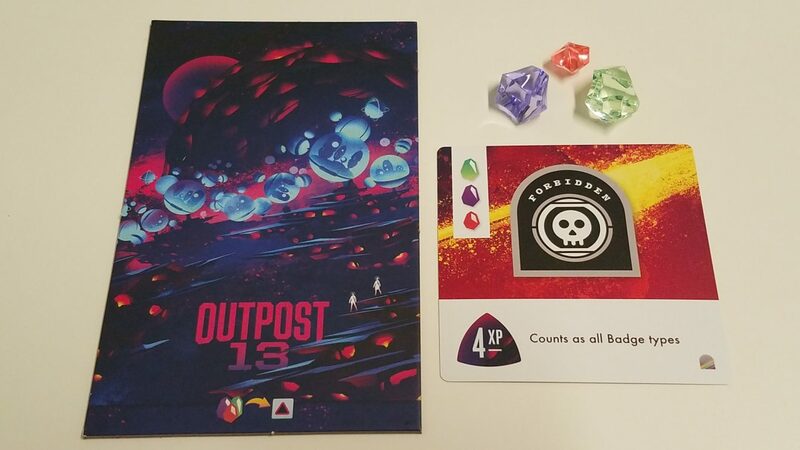 Each one requires a combination of crystals to be turned in at Outpost 13, and many of them give bonuses beyond just the points their worth, including discounts on future badges, increased effects for visiting locations, and synergy bonuses with other badges of certain types. 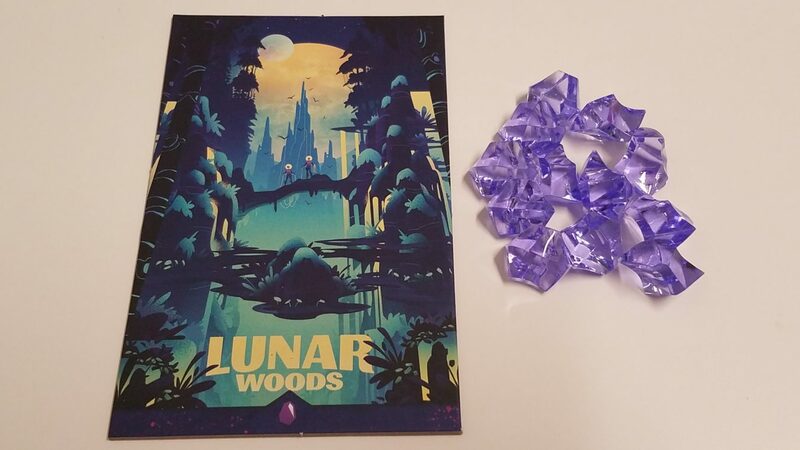 Andrew: The strategy in Space Park comes from planning around how best to efficiently gather the crystals you need to score your points and win. 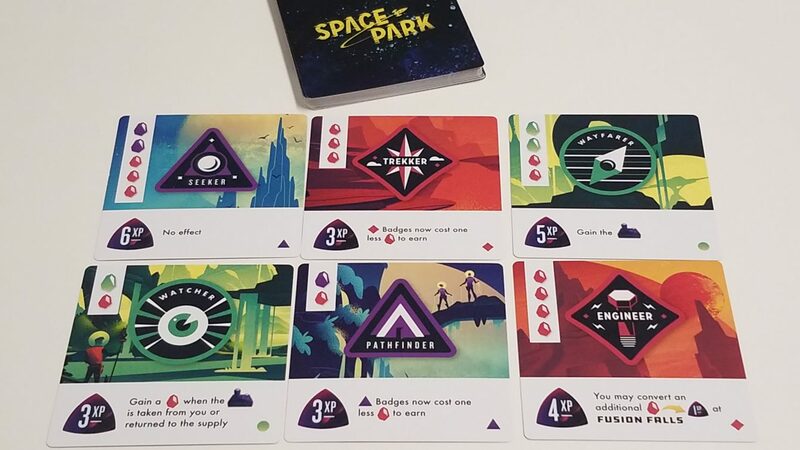 Space Park is a percussive game – turns are often blindingly fast, and there is a constant need to balance the impulse toward long-term planning against the reality of your limited ability to actually control the board state. 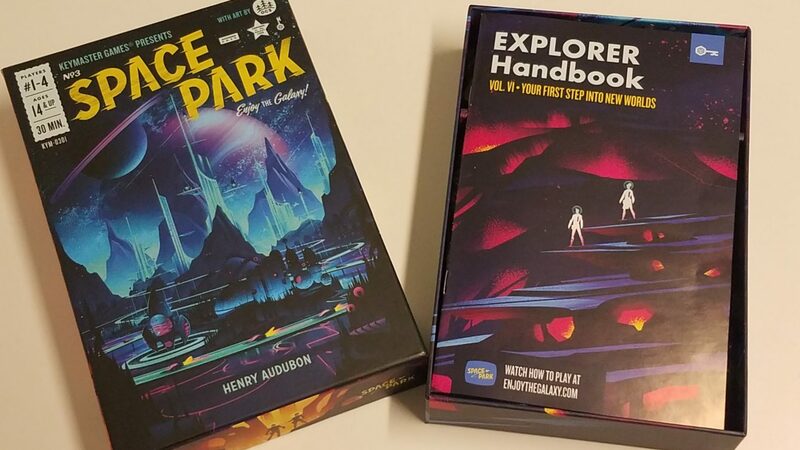 Jess: Yeah, Space Park didn’t really lend itself to focusing on what other players were doing much – mostly, we were just working towards our own badges, rather than trying to spend our precious actions to stymie other players. The presentation in Space Park is *stunning*. The art from Brian Edward Miller is just fantastic, and the aesthetic blends retro sci-fi, a fascinatingly unique color palette and high quality component design. 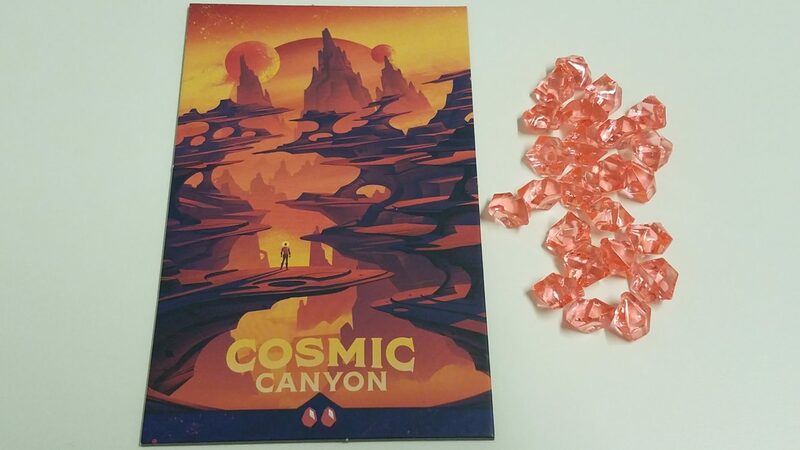 The rockets are beautiful, highly detailed minis, the crystals are chunky, and all the tiles and tokens are well designed. The only little oddity is that Scout, the robot, is a standee rather than a mini, which we never would have thought twice about, except that it is so different than the rockets. But we won’t complain about another example of Brian Edward Miller’s artwork making its way into the game. Jess: So, on the whole, we had a really great time with Space Park. But it’s important to remember that this is absolutely a light game – when we say turns take seconds, we really mean it! At 2 players, it can sometimes feel like speed chess! Andrew: And for us, that’s a great thing! But this won’t be a game to pull off the shelf when you’re looking for deeper strategy or lengthier, thinkier gameplay. We really enjoyed Space Park. Between the gameplay and the presentation, there’s a lot to love in this box, and it’s absolutely worth hopping on a rocket and heading on over to check it out!